Hey there! Thanks for dropping by Squid in the City! Take a look around and grab the RSS feed to stay updated. See you around! Betsey Johnson’s Tweezerman collection? Yes, please! I have to tell you a little story about Tweezerman tweezers. Back when I was in high school, my mom and I entered a contest to win one of 100 Tweezerman tweezers from Good Housekeeping magazine. We entered by mailing in postcards with our names and addresses and waiting patiently. We’ve often entered sweepstakes before, but this time we actually won! We were overjoyed! While I was living home, my mom and I shared those tweezers. They were a huge upgrade from the old tweezers we used to have. Their precision slant tip made is infinitely easier than ever to grab even the tiniest hair! When I moved, my mom allowed me to take our communal pair of Tweezermans to college and then to my own apartment. (What a good mom!) In my apartment, my roommate once dropped them, dinging the edge. I (who am not quite ready to be on Hoarding: Buried Alive, but who also keeps things that I think I may need in the future) still had the original package from the tweezers. “Free sharpening,” it said! I sent the tweezers in, and they were repaired to their full splendor! I cannot say enough about Tweezerman products. But wait! They just got a little better! Betsey Johnson, one of my all-time favorite designers, has teamed up with Tweezerman to create a collection! This three-design series will be available at Sephora. 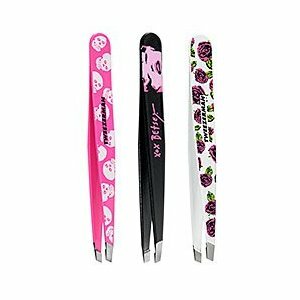 There is a hot-pink tweezer featuring white skulls, a white tweezer with pink roses, and a black tweezer with… wait for it… pink faces reminiscent of Marilyn Monroe! I am in love! Get ye to Sephora, squidlets, and get ’em while they’re hot! Have you ever noticed that big life changes occur all at once? For me, this is always the case. This week I’ll be beginning a new job at a children’s museum! I am thrilled to begin a new job! I feel re-energized and ready to tackle some other things in my life. One of those things is a closet makeover (more on that soon! ), and the other is getting back to a healthy weight! I know I have about 30 pounds to lose. I have had some success with Slim-Fast in the past, and I have used it in conjunction with Weight Watchers to meet my goals of having a healthy BMI. I, however, did a poor job maintaining my loss and (sadly!) have gained the weight back. I had a lot of excuses because I was finishing graduate school and writing a thesis, I was unemployed and could not afford the healthier choices, I was on vacation, I had no time for exercise. Excuses, excuses! I’m ready to stop making excuses and start making a change! After my visit to the Unilever Penthouse last month, I had the opportunity to speak with Ali, a registered dietician at Slim-Fast. Ali helped me to see the ways in which the Slim-Fast plan fits into my lifestyle. Slim-Fast is a great way to control your calorie intake and learn portion control. Itworks on a 3-2-1 plan. What that means is, each day you eat three snacks, two meal shakes or meal bars, and one balanced meal. Each snack can be a Slim-Fast snack bar, a fruit or vegetable, or another snack of approximately 100 calories. I am psyched to pack my lunch this week — I love the Slim-Fast products! They taste great and really do keep me feeling full and satisfied! I love the Chocolate Peanut Caramel meal bar, and the Double-Dutch Chocolate snack bar is not to be missed! Canned shakes are great for on-the-go. When I have extra time, I love to have the powdered shakes (just stir into milk and ENJOY)! Although I know I want to lose 30 pounds (see above! ), Ali explained that a great first goal is to lose 5-10% of your current body weight. For me that’s about 8 or 9 pounds. Cross your fingers for me! How have you successfully reached a weight goal? Please share your tips!!! Friends, I have some very exciting news to share! I have won an iPad for myself and one for my dear friend Aly! SheSpeaks ran a contest in several blogs (including Aly’s). It was sponsored by Propel, the enhanced water that keeps you hydrated while doing sports or fitness activities! Propel was seeking recipes for using their new Propel Powder Packets with Calcium — convenient single-serving packets that add flavor and vitamins to any water (great for when you are on the go!). The author of the winning recipe would win 12 boxes of Propel packets and an iPad for themselves, AND for the blogger that ran the contest! I purchased some Propel Packets and got to work! My inspiration came from the health benefits of Propel as well as the hot summer months which demand mass consumption of frozen novelties! How could I combine these two? The answer: Propel Creamsicles! Non-fat vanilla yogurt, Citrus Propel Packets and canned mandarin oranges come together in the freezer to become a yummy and healthy ice pop! Lo and behold, the winner was chosen… and it was me! I can hardly believe it! I am very excited to have won an iPad for myself AND my friend! You can look forward to some reviews of apps and iPad accessories. Until then… enjoy some Propel Creamsicles! Prevent chapped lips by using a generous amount before bed. Use some on your cuticles instead of oil. When your favorite lipstick is nearly done, scoop out the remainder and mix with Vaseline to create a lip gloss. Use some to tame your eyebrows. Use it as a makeup remover. 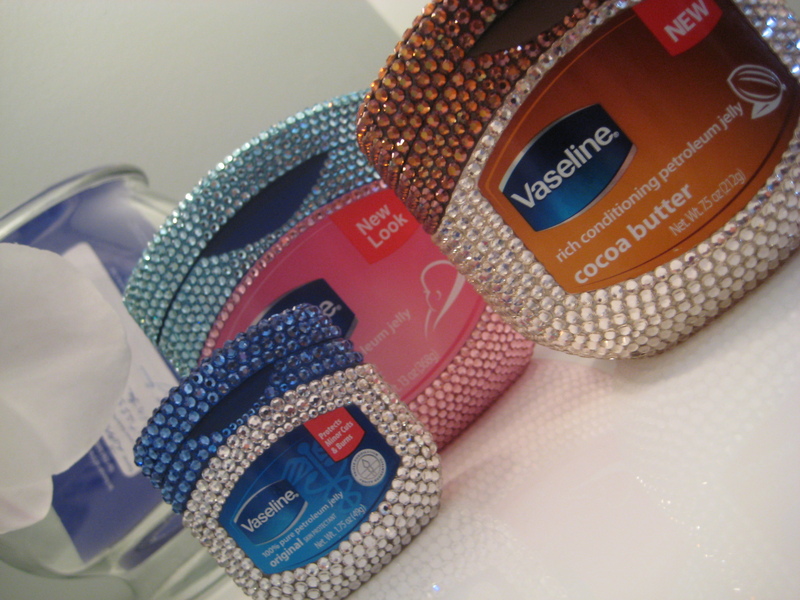 How do YOU like to use Vaseline? Comment below! I just returned from an excellent family vacation in St. Simons Island, Georgia. My very close-knit family lives there and in the surrounding areas, so I am frequently down there for family functions. This weekend, we were throwing a baby shower for my cousin Brad and his wife Lizzi who are expecting their first child in October! To add to my excitement — they are not finding out the baby’s gender! It made buying gifts into a fun challenge since I had to find clothes and accessories that were gender-neutral. The party was a huge success! First, I baked mini black and white cookies according to this recipe from Epicurious. (Since I have a big family, I actually doubled the recipe.) To simplify, I lined each cookie sheet with parchment paper. It makes a HUGE difference and helps you remove these cake-like cookies from the pan without crumbling apart. While the cookies were cooling, I began making the icing according to the directions. You will be putting half the icing into one bowl and adding cocoa powder. The other half is your white icing. Split the white icing into two separate bowls. Whisk in a drop or two of blue food coloring into one bowl, and a drop or two of red into the other until you’re satisfied with your pink and blue colors. When the cookies are COMPLETELY cooled (don’t put the icing on when it is still warm; it’ll run right off! 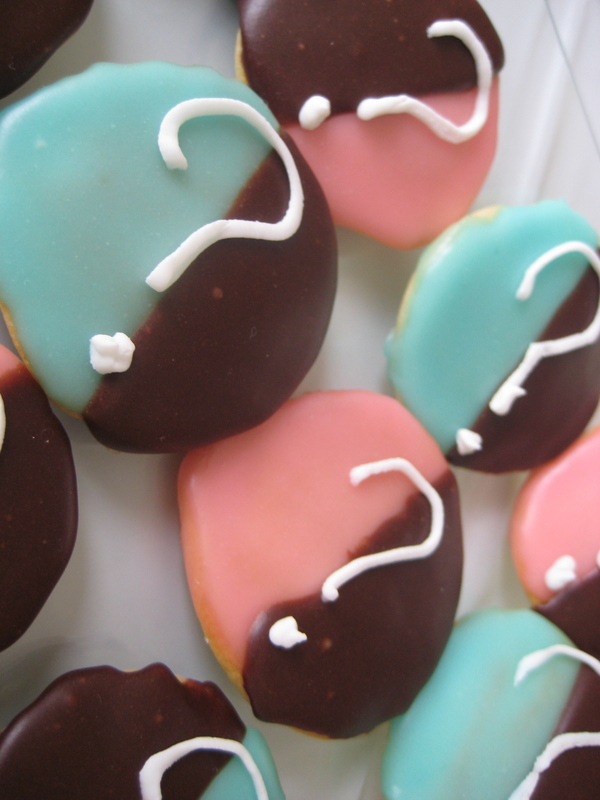 ), ice half of each cookie in pink or blue. I actually went back and applied a second layer of pink or blue icing because I wanted a stronger color (the icing is a bit sheer). When you’re happy with your pink and blue halves, go ahead and ice the other half of all of the cookies with the chocolate icing. Let the icing set overnight! It becomes like a shell. Using a tube of Cake Mate white icing, I piped on the question marks. These cookies were a HUGE hit with the family and the expectant couple! Thought I would share this idea… it could be done in all-pink or all-blue for those who know the baby’s gender (without question marks) too! Last week, Suave was one of my gracious hosts at the Unilever Suite during BlogHer. Little did I know, a treat was in store for me! I got to have a hair appointment with celebrity stylist Jenny Cho! Jenny (whose client list includes the Olsen twins and Claire Danes!) gave me some great tips and product recommendations, and I am excited to share them with you all! First of all, Jenny asked me about some of my “hair issues.” (Don’t we all have them?) I let her know that I do a lot of flat-ironing in the fall and winter, but that I have been embracing my natural hair texture (wavy) lately for summer. Generally speaking, my summer styling has included towel-drying my hair, putting some product in, and letting it air-dry. I was proud to learn that Jenny totally supported this! She said that giving my hair a break from heat styling was very good to do, saying that it is similar to giving your nails a rest from constant polish in the winter. Sometimes it is necessary to just go au naturale! For my styling session, Jenny demonstrated how I can ramp up the waves I already have. She used a 1.5-inch barrel curling iron and created curls that turned away from my face. The curls are more distinct than my usual lion’s mane of waves, giving a sleeker and more sophisticated look. Jenny did this in about ten minutes, and it created a great look that could easily transition from day to night. She also used Suave Professionals Weather Protection 365 Cream Gel while she was styling my hair. The product has such a light feel. It did not weigh my hair down, and it kept my hair frizz-free even during a super humid day in the city! My hair is highlighted, and Jenny showed me some great Suave products that can keep my hair from getting dry, brittle, and damaged. Suave Professionals Almond & Shea Butter shampoo and conditioner is very moisturizing, and it is great for color-treated hair like mine. I tried it, and it has a light and very hydrating feel. It left my hair feeling silky and healthy! Best of all, the products I described above, as well as the other amazing products in the Suave Professionals line, are salon-quality, but are available at drug stores and are very friendly on the ol’ wallet! Style on! I’ve just returned from a family trip to St. Simons Island, GA. I missed you and you and you! I’ve just got to share a new website discovery! My cousin told me about this great website, PaperBackSwap! I’m in love already! If you’re an avid reader, I think you are going to love it. PaperBackSwap allows you to post books you no longer want. Other readers have done the same, giving you a huge catalog of books to search from. When you post five books, you get a “credit” for one book. You also get a credit for every book you send out to someone. Use your credits to get books from other readers! When someone chooses one of your books, the site gives you a super-easy and printable mailing label, then you can package your book and send it to the person who requested it. Books do not have to be in “mint condition.” They must be readable and have all of the pages and the covers. What I’m excited about is having access to lots of books, but getting them for free! Plus, it is an amazing way to de-clutter my apartment (something I’m always looking to do). Also, being a busy bee, I often have difficulty reading fast enough for the library’s due dates. I’ve been a member for a day, and already I’m looking forward to my first book’s arrival, and I’m also packaging up a book to mail out! How fun! It’s like a book club… with the world! Happy reading! Greetings from the Royalton Hotel! I’ve left my apartment (and my beloved fishes) in Brooklyn for three nights, and I feel like I’m on a “staycation”… in Manhattan! Aly and I are guests of Unilever for the duration of BlogHer 2010. We were expecting to be roommates in the hotel, however when we arrived we were notified that the Royalton was out of double rooms. As a result, we were given individual single rooms! Hello, upgrade! My friends at Unilever are the greatest. After checking in, my room was decorated with some awesome gifts of Unilever products. I don’t know if I truly realized how many products come from Unilever until this weekend. I for one know I couldn’t go a day without using at least one of them. Dove has been my favorite deodorant for a while. Also, I can’t fall asleep without generously coating my lips with Vaseline! Not to mention, my standard favorite breakfast is a Slim-Fast shake! Today, in the Dove suite, I enjoyed refreshing spring water infused with flavors inspired by Dove’s refreshing scents. I also got to DECORATE FLIP FLOPS. I am a CRAFTS-ENTHUSIAST who uses caps lock sparingly, but I need to whip out the ol’ caps lock when I tell you that I GOT TO DECORATE FLIP FLOPS!!! With solid-colored flip flops as my canvas, a hot glue gun, and enough lace, silk flowers, sequins, rhinestones, buttons, beads, pom poms, and rick-rack to craft flip flops for an army, I set to work. You can see the fruits of my labor int he photo above, along with a tableau of some of my favorite Dove products! My yellow ‘flops are festooned with pink lace and a yellow daisy… with a white dove in the center of each daisy. How fitting! But wait! There’s more! Aly and I also experienced our first piticures! Out hands, arms, underarms, shoulders, and back were in for a treat! A piticure begins with a hand and arm massage, followed by a cleaning of the underarm area and an application of Dove deodorant (don’t be afraid, ticklish friends; you do this part yourself), and finally a shoulder and back massage. What a relaxing and refreshing experience. The vibrant-but-not-overpowering scents of the Dove products truly relaxed and energized me. My mom, a nurse, likes to wear fresh-smelling body products, but tends to avoid those with overly strong scents because they can be disturbing to her hospital patients. I know I’ll be sharing some Dove GoFresh products with her because I know she’ll love them. After all, she introduced me to Dove first! It was love at first sight. I owe her one. Thank you to Unilever and the Dove team! More from the Penthouse, coming soon! Two days ago, my dear friend Aly Walansky invited me to accompany her to a Via Spiga event at the Empire Hotel in Manhattan! I was more than glad to accept; we have been to the Empire’s penthouse before, and let me tell you — if you ever get the opportunity to visit, don’t miss it! We were there to celebrate Via Spiga’s 25th birthday! This luxurious, Italian brand features fashion-forward footwear designs that are elegant and timeless. I loved the new fall collection that features a signature crystal snake brooch on each shoe. I fell in love with an open-toed gold-ish/bronze-ish pair; it was such a fresh interpretation of a neutral color. You can see an excellent photo of it here. Aly was more partial to a strappier black pair. What can I say? There was a shoe for every personality! The evening was perfect! The weather was just right: sun to warm our shoulders, breeze to keep us comfortable. The sky was clear and gorgeous, and the atmosphere was relaxed yet energetic. The signature cocktail was amazing, and we had prime real estate for the hors d’oeuvres, which were delish! Aly and I made new friend, Kaci Hamilton! Just in the city for three weeks so far (she just moved from Jamaica), this girl is a total go-getter! She is a student and an intern for Fashion Pulse Daily, plus she has started her own blog, Strangers Have the Best Candy. Keep your eye on this gal. She’s got it goin’ on! Overall a lovely evening with great company and of course — amazing shoes! Those that know me know how obsessed I’ve become with the romper trend this season. I hope it never dies. Rompers make me feel like a girl of six again. They’re youthful, playful, and fun-loving! They also have a modesty factor — since they’ve got “legs,” they are nearly guaranteed to stay down and not ride up like a skirt or dress might do. My interest in rompers began with the purchase of one at the Gap outlet. It’s pajamas! I couldn’t stop wearing it, so I added a second romper-jammie to the collection, this time from Target (mecca for budget-friendly gals like me). Soon after, my awesome mom got me another color of the romper I loved was obsessed with from the Gap. (THANKS, MOM!) I also have a pretty sweet silky looking romper that is NOT pajamas; it is actually clothes, and it is dressy! I saw it, and it was love. Best of all, I had a $15 credit to use at Ideeli, and this romper was already on SALE!!! I love the graphite color (gray is such a hot color, especially if you — like me — are SO OVER black). I have to credit my pal Aly Walansky for introducing me to Ideeli. Ideeli’s got amazing sales on designer and name-brand items. Also, it’s not just clothes! They also have luggage and housewares, kids’ stuff, and more. Not a member of Ideeli yet? Check it out here! Happy romper (or whatever else you love!) shopping!